Hello from Ka gold jewelry and David Weitzman. I'm happy to introduce to you the new designs for August 2008 with symbols of unity, love, balance and fulfillment. Ka-Gold Symbol as an ornament for hanging at home or office. 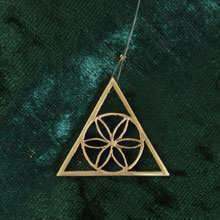 The symbol is composed of a triangle and the inner part of the seed of life. The seed of life is a symbol of creation and enfolds the entire reality. The triangle symbolizes the three forces of creation, a repeating motive in my works. The Ka-gold symbol is a symbol of perfect wish, perfect wisdom and perfect love. Two new version of the golden mean spiral: a smaller version of the old pendant and a ring. The Fruit of life is the "Holy of holies" of Sacred Geometry. It is not revealed like the Flower of life which can be found in many places in the world. In fact, it is the hidden secret of Sacred Geometry. The shape of the Egg of Life is the second stage after the structure known as "the Seed of Life" - 7 circles intersecting and known as the geometrical/mathematical basis of the entire creation. The structure of the Seed of Life is the primary structure of creation. Everything that exists in the universe evolved from this structure since it contains all the mathematics and geometrical laws upon which reality is built. The structure of the seed of Life also symbolizes the seven days of creation. A beautiful ring composed of the Seed of Life symbol and the Flower of Life. The ring is made in two sizes for your selection. The Pentagramic Torus knot is one of the knots that can be created on the Torus tube. The Torus tube is a shape created out of the basic structure of creation - the Seed of Life. It is a 3 dimensional shape that looks like a ball, with its surface going in and out of its center. Shema Israel prayer is the most known prayer in Judaism. The source of the sentence is from Jacob who is named Israel. When Jacob was about to die he called upon his sons and swore them to continue believing in the one G-d. The meaning of this prayer is hear O Israel, meaning hear Jacob; our G-d is the one G-d. I created the Ben Porat Yosef Hamsa pendant while looking for a symbol of abundance and fertility in the sources. On the pendant is inscribed: "Ben Porat Yosef, Ben porat alei ayin, bnos tzoados alei shur." My intention as the creator of this piece is to open to you, the wearer, the door to unity and understanding that everything that exists is one body, and you are a part of it. To receive the discount, please enter coupon number: BE5535HAPPY at the remarks field of the order form (or at the Paypal remarks field). We will refund the 10% and send you a new order confirmation with the discount.